Apple on Monday released three new Apple Watch spots done up in the usual "poppy" style introduced with the first Watch ads, this time highlighting third-party travel, fitness and music apps. The latest promos again put Apple Watch hardware front and center, but place a greater emphasis on third-party software than previous advertisements. Apple carries over the "floating device" concept and adds in a layer of undulating circular app icons that at the start of each spot explode beyond Watch's bezel. Subsequent shots show onscreen app simulations, much like the "App Store Apps" section of Apple's dedicated Watch webpage. 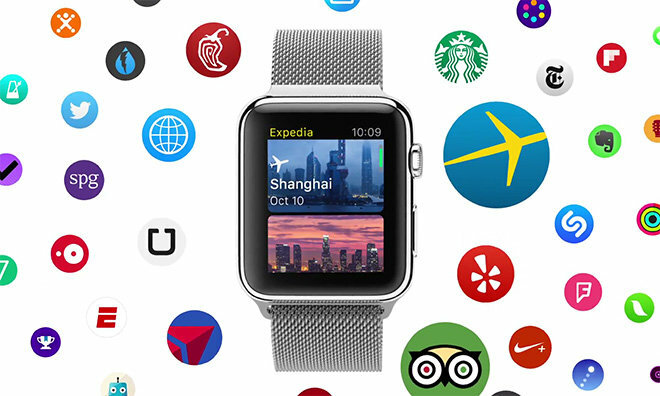 For its travel-minded commercial, Apple features Expedia, Uber and Yelp. Fitness apps include Nike+ Running, WaterMinder and, curiously, MLB At Bat. Finally, Apple throws a spotlight on music apps like Shazam, Pacemaker and StubHub. Unlike past Watch ads, the trio of short commercials shies away from putting too much emphasis on Apple's first-party software. As with iPhone and iPad, developer support plays a key role in platform success, and to that point Apple is equipping coders with better tools and greater access to hardware functions. For example, watchOS 2 will launch this fall with support for native apps, allowing commands to be processed on-device instead of offloaded to an iPhone.